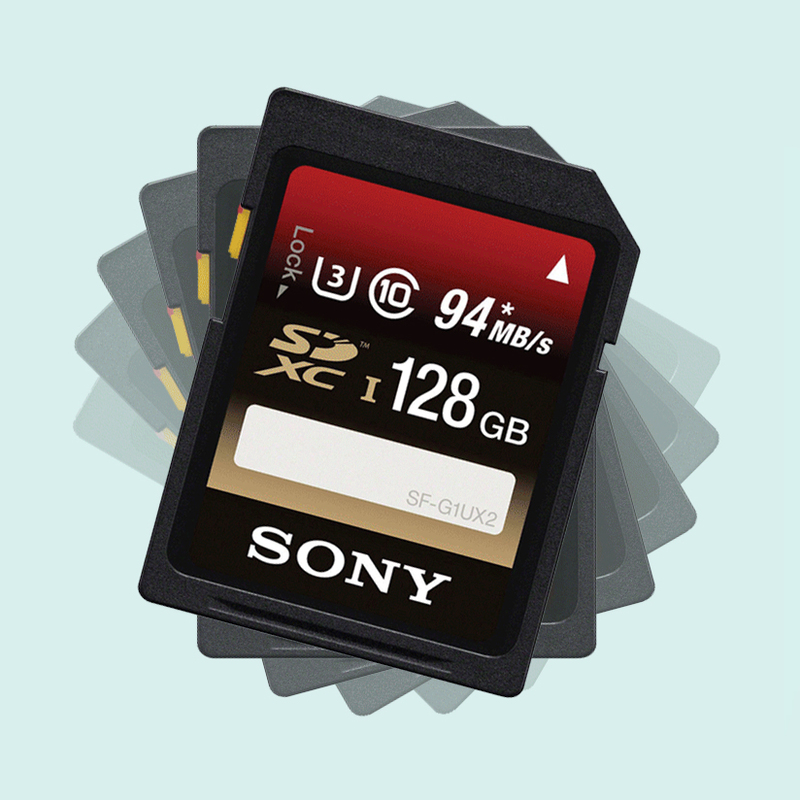 Capture 4K video with the 128GB High-Speed UHS-I SDXC U3 Memory Card from Sony. This SDXC memory card comes compatible with the UHS Speed Class 3 rating denoting a minimum data read speed of 30 MB/s which is sufficient for capturing 4K content as well as high-speed burst mode photos. With a maximum data read speed of up to 94 MB/s and maximum write speed of up to 70 MB/s you can transfer even large files to and from the card quickly. This card also comes with downloadable File Rescue Software to help recover your photos and videos should they become damaged or accidentally deleted. 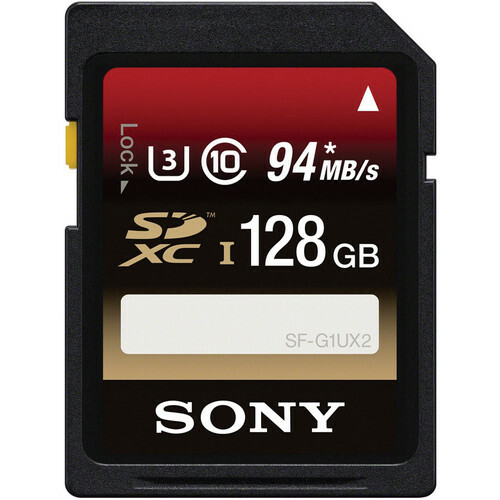 128GB High-Speed UHS-I SDXC U3 Memory Card (Class 10) is rated 3.5 out of 5 by 100. Rated 1 out of 5 by Q3 from died 3 months bought this card on 1/28/2016. it failed on 4/30/2016. was working great in my A99 and halfway through it shoot failed. it had some weird screen prompts to try to recover the data or cancel but couldnt get through the prompt options. had to stick in another memory card and format, other card works fine. now when i reinsert the 128gb card it says Unable to read memory card. Reinsert memory card slot 1. cant recover, cant format, cant nothing. i load into my home computer and the sdcard drive freezes. downloaded sony's Memory Card File Rescue, and the 128gb even causes that to freeze up. but if i remove this card, everything works again on my pc. trying to return this card for warranty now. Rated 2 out of 5 by Rodney from Failed after 1 month I was in the North Atlantic on a Viking Cruise in Greenland when this memory card failed approximately one month after purchase. No possible way to replace it on the local economy. Fortunately, I had been downloading my images daily and I lost no photos. Also fortunately, I had, for reasons not clear to me at this time, purchased a spare, identical chip and had it with me. So I could continue taking pictures the rest of my cruise. But I lived with a sense of potential imminent failure of the second, totally irreplaceable memory card. Didn't happen. Won't buy a Sony memory card again. Rated 1 out of 5 by Bill from Lost 500 pictures on this memory card I bought this card before a vacation. I used the memory card in my Sony a900 camera. After 3 days and 500 pictures, the card had a recovery error and then was unreadable by the camera. When I got home I sent the card out to try and recover the data but they were unsuccessful. So, I lost 3 days worth of pictures while in Paris. I'm very upset over this. I will never purchase a Sony memory card again. Rated 1 out of 5 by NatParkGuy from Failed after 2 months Similar to other recent user posts, my card failed after a little over 2 months of use (purchased 3/25/16 and died 5/29/16) after an error screen displayed on the camera screen. Can't get computer to recognize the card either and all my other model/types of memory cards work fine in both the camera and computer so it's not an issue with those. Deep discount in price at the time was worth the try but never again. Was glad I was at least able to pull the 900 or so pictures I took from a trip to Lassen Volcanic and Lava Beds National Parks off before it failed. Will definitely be sticking with Transcend or Sandisk cards in the future ... never had an issue with any of those in 10+ years of use. Rated 1 out of 5 by Jonathan from Two Cards, Two Failures I've had two cards fail on me in the middle of shooting with an A6000. Both times were a write failure after a shot was taken, both times the camera tried to recover the data and both times the card was no longer recognized and could no longer be formatted. I don't think I pushed over 300 photos over each of them. I'm fortunate not to have lost any super valuable photos, but it seems like an inevitability with this card, seeing other people's reviews. Do yourself a favor and get another brand like the Sandisk Extreme Pro 64 Gb... less memory, yes, but far far faster. Rated 1 out of 5 by Wade from died - lost photos - waiting 4 months for replacement We lost lots of Grand Canyon, Painted Desert photos. The card went down with no warning, and then card was not even visible to rescue software to attempt saving the photos. 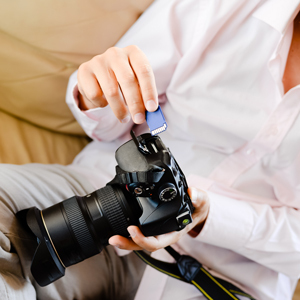 I am a member of Sony Imaging PRO Support, but they're not allowed to warranty memory cards. I called Sony Consumer support, got transferred 3 times before someone could warranty the card. Mailed it in almost 4 months ago, and still have not received a replacement. Rated 1 out of 5 by Chris from FAILED!!!!!!! DO NOT BUY!!!!!! This card failed after 4 uses. It just died and is not recognized in any devices. No recovery options. I lost an entire event and also lost a client. Has anyone tested this card with the Sony RX100M4? Specifically 4k (100mbps). Supposedly some cards will not support all video features of RX100M4 despite having a U3 rating. Yes, works fine for 4k and 120fps recording. will this fit in the Sony FDRX3000 AS300? No, it will not fit. It is too big! You need a micro sized card. Does any one know if this card works with sony fs 700r ? I bought this Sony 128GB SD card, and used it with my Nikon D750. The card suddenly broken in the camera, and cannot be read now, even in the computer. I just used it for about two hundreds pictures so far. just wondering if the vender can help recovery the PICs on the card? I had camera HX300 dscr Can I use sony 128 GB high speed this product? Yes, it worked fine for me. That's the one that Sony recommends and sells. You need write speed of at least 60mb/s and the card delivers that. Most other cards confuse users by advertising mainly the read-speed and do not tell you easily their write speed. 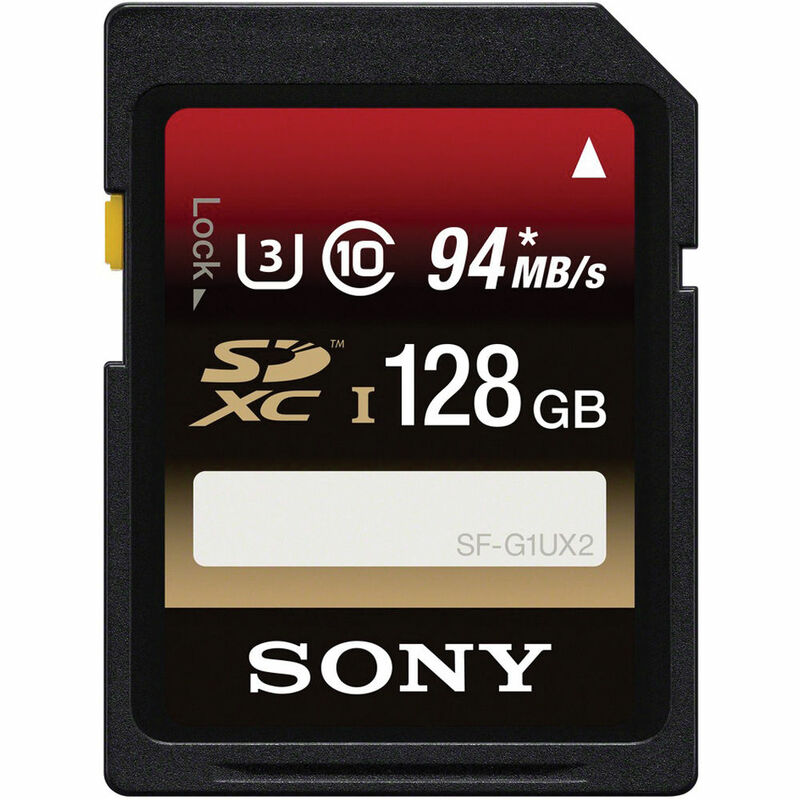 Will this Sony 128GB High Speed UHS-I SDXC U3 Memory Card (Class 10) work with the Sony FDR-X1000V?Will it shoot 4K video? Yes, it worked fire for me. That's the one that Sony recommends and sells. You need write speed of 60mb/s and the card delivers that. Most other cards advertise mainly the read-speed and do not tell you easily their write speed.